Do you want to increase bandwidth and reduce network vulnerability while reducing costs? The HPE Ethernet 10/25Gb 2-port 631 Adapters deliver the capability to drive either 10G (SFP+) or 25G (SFP28) speeds, providing the option for a large jump in Ethernet performance. 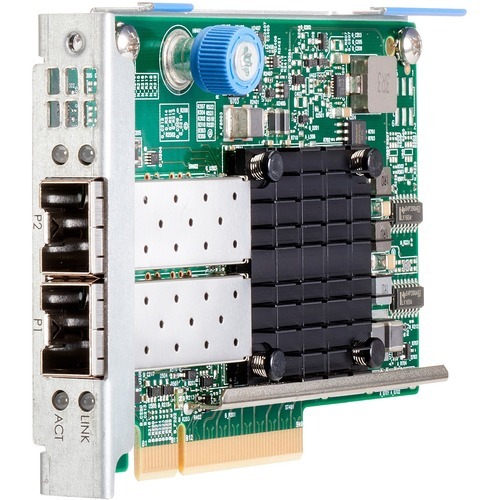 Compared to a 10G implementation these adapters offer cost reductions by lowering the number of servers, adapters, cables and switches while accelerating server performance and targeted workloads. These adapters help prevent, detect and recover from cyberattacks by protecting applications, data and server infrastructure by authenticating digitally signed firmware via a Root of Trust architecture. In addition, they offer Secure Boot, Device-level Firewall and other advanced security features. The HPE Ethernet 10/25Gb 2-port 631 Adapter blocks installation of rogue or corrupted firmware and verifies that the executing firmware is trusted via Hardware Root of Trust and Authentication. Stops unmanaged access to memory or storage with Device - level Firewall. This validates that on-device firmware and configuration data can only be accessed by authorized agents. Provides traceability into authenticated firmware updates by capturing changes in standard system logs. The HPE Ethernet 10/25Gb 2-port 631 Adapter delivers single root I/O virtualization (SR-IOV) with the ability to run a large number of virtual machines (VMs) per server, which reduces the need for hardware and the resultant costs of space and power required by hardware devices. The HPE Ethernet 10/25Gb 2-port 631 Adapter offloads packet processing to reduce CPU utilization and lower power with Tunnel Offloads (VXLAN and NVGRE). Speeds packet processing to service more I/O requests utilizing data plane development packet (DPDK).